Grisedale Tarn is a tarn in the Lake District between Fairfield and Dollywagon Pike. It is the legendary resting place of the crown of the kingdom of Cumbria, after the crown was conveyed there in 945 by soldiers of the last king, Dunmail, after he was slain in battle with the combined forces of the English and Scottish kings. 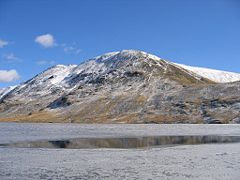 Grisedale Tarn is around 1,770 ft in altitude and has a depth of around 110 ft. It holds brown trout, perch and eels. The outflow is to Ullswater to the north east, picking up all of the rainfall from the eastern face of Dollywagon Pike. The Tarn is the subject of a poem by the Rev. Frederick William Faber printed in 1840. Discovering the wonders of our world.